According to most, last season was one of transition for Swansea, largely due to the controversial dismissal of Laudrup and appointment of the inexperienced Garry Monk. Although the threat of relegation was probably a bit overplayed by fans and pundits alike, a 12th place finish was quite flattering after what was a difficult season for the Swans. Many were swift to blame their Europa adventure for lacklustre domestic performances, but if you offered fans a dream tie with Napoli and Premier League safety at the beginning of the season, they would have taken it without hesitation. There were positives, too. Wilfried Bony was a bit of a relevation and, more importantly, is (probably) staying despite seemingly infinite rumours about him. Jonjo Shelvey, a largely criticised signing, was also something of a surprise package and some (mainly me) still think it was weird that there were no calls for him to be in an England squad that, in hindsight, really did lack flair. Notable cup finishes: None really. A hard-fought tie with Napoli was unluckily lost, though. In terms of TSR and SoTR, Swansea actually have higher ratios than I initially expected. Although obviously not fool-proof, they tend to reflect team quality, and Swansea’s stats are pretty good. Monk has repeatedly committed to sticking to ‘the Swansea way’ which, based on a combination of continued safety and indicative stats, does seem to be effective. As it turns out, there’s not that much difference, but Monk didn’t really have time to implement any real tactical changes. 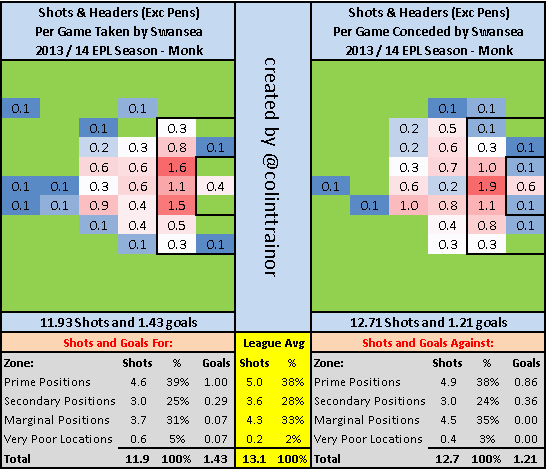 The spike in shots from ‘very poor locations’ is probably entirely down to Monk’s willingness to play Shelvey regularly, while a slight decrease in shots taken is a likely consequence of his more defensive set-up against the bigger clubs. 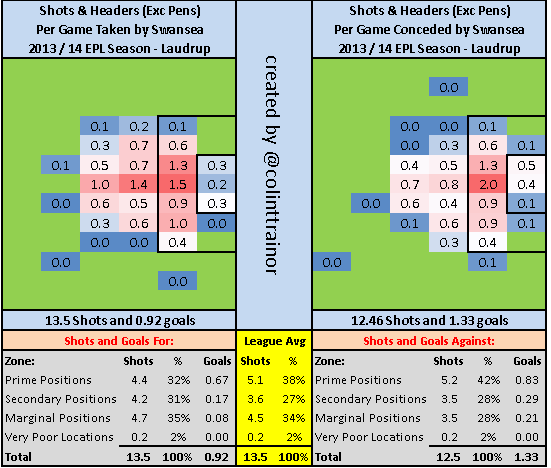 In relation to other teams, Monk’s Swansea is pretty similar to the league average in terms of shot locations, both offensively and defensively. Were he to play Gomis and Bony together consistently, I’d predict an increase in the percentage of shots from prime positions as the team focuses to supply the two. As an ex centre-back, one would expect Monk to work on limiting the amount of shots conceded in the most dangerous areas. The likely transfer of Napoli’s Fede Fernandez should help improve the defence. The biggest problems for Monk in the upcoming season are likely of a tactical nature. A 4231 is the safest option but he has tinkered with a Rodgers-esque diamond midfield before and may be tempted to try something similar to accommodate both Bony and Gomis. A possession game, though, requires fluidity and a spine that I’m not so sure is possible in a two striker formation – Liverpool’s biggest successes with it came in a counter attacking capacity. What Monk decides on for the opener against Manchester United remains to be seen, but I’d sway towards keeping Gomis as a 60th minute substitute in most games to maximise the effects of the striker depth. How good was Wilfried Bony? Bony’s stats are pretty impressive for a Premier League newcomer, but those who paid attention to his obscenely good season in the Eredivisie for Vitesse weren’t surprised by his performances. 16 league goals is an impressive haul, especially considering Laudrup played Michu over him at the beginning of the season. Wilf exploded after Christmas as he became accustomed to the league, and was more of a creative threat than some expected – his backheeled assist to De Guzman in particular springs to mind. Holding onto him is a pretty big deal. Personally, I’d like to see the team play to his feet more often next season and raise those key pass numbers. According to WhoScored, Swansea averaged only a single through ball a game, which seems a tad bizarre for a possession-based system. Bony may not be the fastest but I’d bet my life savings (not that much of a gamble) on him holding off defenders to get onto a pass played between the lines. 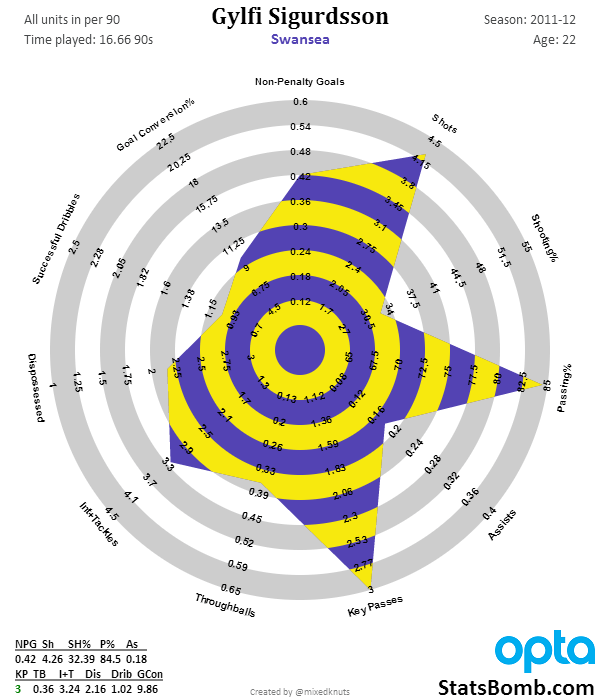 0.47 NPGA90 is good, but it’s not top tier stuff and I’d like to see him score from open play more often next season. It says something that swapping Ben Davies, a local hero, for Gylfi garnered mostly positive reactions from fans. Bitter comparisons between Davies, Shaw and their relative prices aside, the best thing about the Sigurdsson signing is that fans know what to hope for. Simply put, during his loan spell at Swansea in 2012, Gylfi was unstoppable. Just look at that radar. 0.42 NPGA90 is only 0.05 less than Bony last season, while 3 key passes per 90 is in David Silva territory. Even if you factor in any possible regression at Spurs (where he was regularly played out of position), he’s only 24 and a partnership with Bony could be deadly. ‘Pundits’ have been awfully keen to point out that the Swans have lost three of their best players in Davies, Vorm and Michu, but fail to notice that the replacements are probably more than ample – Taylor, Fabianski and Gylfi/Gomis respectively. People forget that, before injury, Taylor was regularly linked to top clubs and played well in the Olympics. Arsenal fans have always said that Fabianski is underrated, and he was signed on a free. Michu is the most difficult to replace but, in a sense, he was already replaced by Bony last year, with Sigurdsson and Gomis in to plaster any cracks. Despite something of a Spanish exodus, it’s been a successful transfer season for Swansea. Jefferson Montero, who was a livewire for Ecuador at the World Cup, should bring some unpredictability to their attacking and Federico Fernandez, a runner up at the same tournament, looks likely to join. 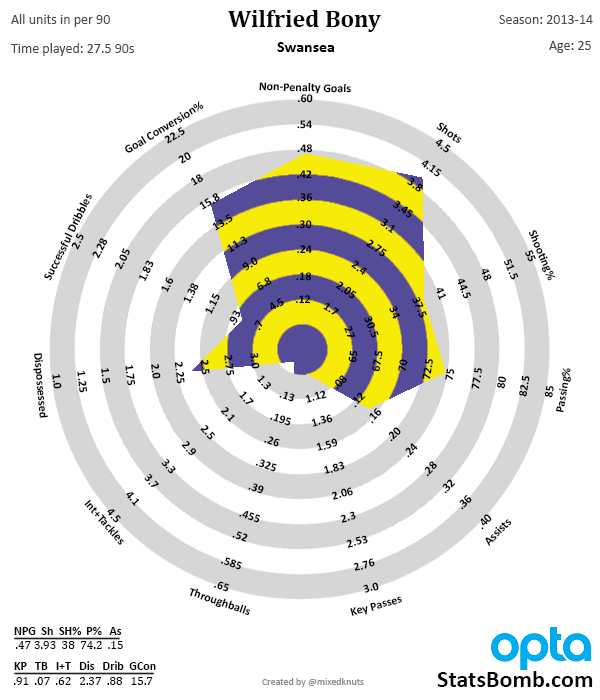 Swansea reportedly bid around £10m for Bafetimbi Gomis last summer, so to sign him on a free and keep Bony results in pretty fantastic striker depth for a midtable club. After putting up with Alvaro and Shechter in recent seasons, Swansea fans will just be happy to know that their second choice striker can actually score. Monk has publicly commented on the need for a defensive mid and possibly a right back, so expect at least one more signing before the end of the month (as I write this, rumours circulate in France that Swansea have just bid for Montpellier’s talented defensive mid, Benjamin Stambouli, who was linked with the likes of Sevilla and Dortmund recently). Like all football fans, I regularly swing with bipolar trepidation when someone asks me what I predict for the season ahead, but I’m genuinely optimistic about the Swans’ chances of breaking into the top half again next season. Were this to happen, I hope it would bring an end to people ignorantly telling me how much they disagree with the Laudrup sacking as soon as they find out who I support (not that it bothers me…). With a 35-year-old manager, a unique style of play and a Chairman who is a fan, Swansea remain one of the most interesting clubs in the Premier League and I’m confident that they will stay there at the very least.